Precious metals prices zigzagged throughout the week with an unclear trend despite the deprecation of the Euro and other “risk currencies” during last week. There were several reports that were published during the previous week: the U.S GDP growth rate was revised down to 1.3%; U.S new home sales declined in August by 0.3%; U.S consumer confidence index rallied in September; U.S jobless claims declined by 26k to 359k. This mixed signal regarding the development of the U.S economy may have contributed to the unclear trend in major commodities markets. In Europe, the recent developments in Greece, Spain and Italy that included riots against austerity measures may have helped drag down not only bullion rates but also the Euro. By the end of the week, the release of Spain’s budget for 2013, which introduced, according to the Spanish government, austerity measures that are with accordance to the EU guidelines, may have contributed to the rally of the Euro and precious metals rates. Nonetheless, during the week the Euro/USD decreased by 0.94%; further, other “risk currencies” also depreciated against the USD, e.g the Aussie dollar fell by 0.74%. By the end of the week, gold slipped by 0.26%; silver, by 0.18%. 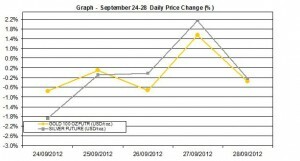 Gold price edged down during last week by 0.26%; further, during said time the average rate reached $1,767.8 /t. 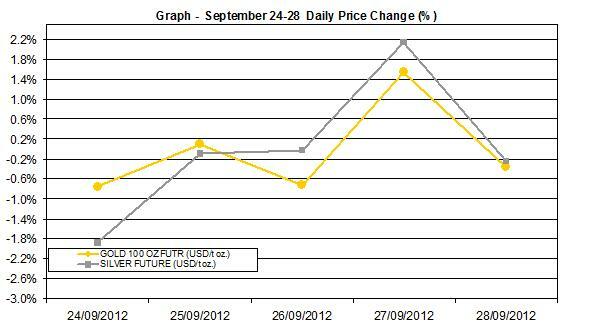 oz which is also 0.26% below the previous week’s average rate of $1,772.34 /t. oz. Gold finished at $1,773 /t. oz. Silver, much like gold, declined on a weekly scale by 0.18%; further, the average rate decreased by 1.09% to reach $34.22/t oz compared to the previous week’s average $34.6/t oz. During the previous week, the average daily percent change of gold reached -0.04%; silver edged down by an average 0.03%. 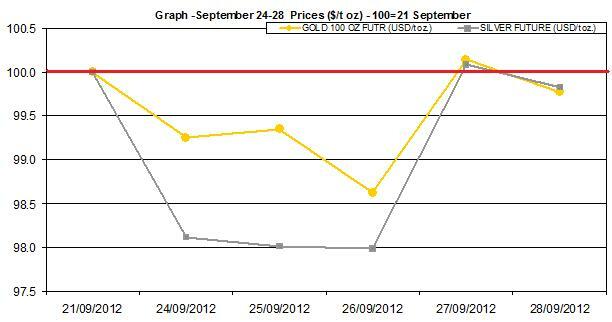 As seen below, the chart shows the developments of precious metals, as their rates normalized to 100 to September 21st. 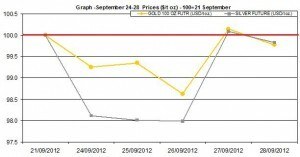 Bullion prices zigzagged throughout the week. The second chart shows the daily percent shifts of precious metals (or in other words the changes around the trend). Silver and gold shifted from gains to losses during the week. During last week precious metals daily percent changes ranged between nearly 2.1% gain and 1.9% loss.